In mine, as you can see in the preview, I have described the evolution of combat algorithms towards the, in my opinion, more elegant schemes that have replaced the combat results tables of the time. The article takes 8 pages, and I go through some selected examples: Napoleon: The Waterloo Campaign, 1815, Hannibal: Rome vs. Carthage, Bonaparte at Marengo, Commands & Colors: Ancients, Tetrarchia, Hellas, Popular Front, and Friedrich. Being my opinion, of course CCA takes the most important part! Once the issue is out, I thought I could share here the section I dedicated to the game, since it expresses, in a very compact way, what I feel about it. In the following, I will quote the CCA section and add between [...] some notes relating it to the rest of the article. The previous examples implemented part of the fog of war by limiting command. Another elegant approach appeared at the turn of the century, in the US Civil War game Battle Cry (2000), the first of the Commands & Colors family by Richard Borg. Different versions of this system have been published since in various settings, including World War II, Ancient, Napoleonic and Samurai, but the most representative example is probably Commands & Colors: Ancients (2006). Figure 6. 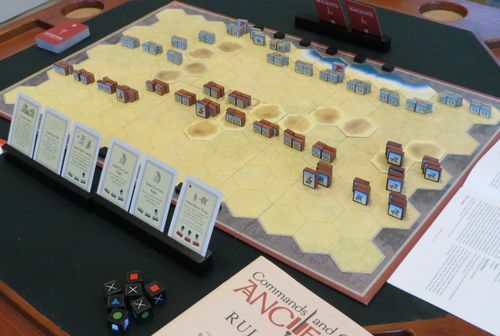 Hannibal traps the Romans in Commands & Colors: Ancients (photo by Rob Judy). Figure 6 shows the main game components: standing wooden blocks, cards and dice. The standing blocks have nothing to do with fog of war as each has stickers on both sides, giving the impression of armies facing each other without the need for miniatures. They give the game an ancient look, and one can almost imagine Greek or Roman generals pushing these wooden blocks in their command tent on the eve of battle. Other versions of Commands & Colors, with fewer unit types, do use miniatures. Commands & Colors has no CRT [Combat Results table], and battles are resolved by a single roll of special dice. Units are light (green), medium (blue) or heavy (red), and the dice exhibit a face of each colour (the ‘Colors’ aspect), a generic face (swords), a leader face (helmet), and a flag. Each unit attacks with a given number of dice, and scores a hit for every target unit colour, every sword if the unit uses them, and every helmet if supported by a leader, plus a retreat for every flag. The result is thus immediately clear, with no need to check tables or calculate odds, which was one of the designer’s aims. It is possible to calculate the probabilities which are implicitly encoded in the dice and unit types , but most players follow their intuition. What really sets Commands & Colors apart is the set of cards (the ‘Commands’ aspect) that players use to activate units on the board. Not only is unit command limited, but it is restricted. Some cards only activate units of a given type, or in a given section, or connected to a leader, or in a given formation, etc. Players may therefore sometimes have no cards with which to activate a given unit, just as their historical counterparts could not always force units to obey their will. Some players, used to having full access to all of their units in a game, may introduce ‘house rules’ allowing any card to activate any unit, but they would then miss out on the intended experience. What are traditional, complex consims [conflict simulations] trying to simulate? Ancient commanders’ most difficult challenges were situational awareness and command transmission, and this still applies to tactical warfare today. Where is the enemy? Where are my units and what are they doing now? How do I abort or rectify this manoeuvre? Traditional war games pretend to simulate war, but by allowing perfect intelligence and communication they fail to capture the essence. They become puzzles of perfect information that players try to solve, by analysing the most efficient manoeuvres and strength ratios that lead to victory. If ancient commanders were given the chance to play one of these games, I doubt whether they would recognise the experience as similar to their own. In the chaos of battle, commanders lost perspective and relied on mounted messengers amidst the noise and dust clouds. Alexander the Great, for example, anticipated important manoeuvres by increasing the number of messengers in certain parts of his line. But messengers could be killed, orders misunderstood, men could panic, delays desynchronise manoeuvres, etc. The Commands & Colors system captures this crucial aspect of war in a unique and elegant way; historically better commanders are dealt more cards, but there is no certainty that a unit will do what the player wants at any given time. This mechanism makes these games not only simpler, but better consims, incorporating elements such as bluffing and boldness. In more traditional war games, players will not try to vainly cross a killing zone if enemy units will automatically shoot them down. However, in Commands & Colors players may dare to do so, since those defending units may not be able to receive orders, giving time to attack them. * Players can guess about their opponent’s situation and plans by observing how they play their cards. . . or are they bluffing? A canny player might have no cards to support a flank offensive, but still redeploy units there as if they did. An ancient commander would probably enjoy such a game. * In different implementations of the system, this might be: a heroic hoplite facing elephants; a GI attacking Tiger tanks; a French Cuirassier charging a British battery; and so on. Elegance in simulated combat is not a tradeoff for realism. Pushing pieces on a board has little to do with war, and no games simulate the real experience, otherwise few would want to play them. However, the designer should aim to provide some feeling of what it was like to be in that situation. The examples presented in this paper transform perfect information puzzles, with the sporadic tension of dice rolls, into games in which hidden information and limited command increase tension and encourage bluffing. If real commanders were asked, I believe that they would choose the latter games as better recreations of their wars. Tradition is a heavy burden, though. However innovative or elegant new mechanics might be, veteran players often raise their shields against novelty. The war gaming hobby needs new and younger members to survive, and the designs that are now emerging show how alive it is. By making combat resolution more elegant, especially the implementation of the fog of war, modern designers simultaneously reach back to the roots of Kriegsspiel and ahead to new players, showing that ‘war game’ is not just a synonym for complex calculations and tedious checks of tables and charts. As war game designer Richard Borg points out: You should fight the player in front of you, not the rules! I hope this piece of text has conveyed the main aspects of CCA that make it my favorite game. While abstracting many things (that make it easy to learn and remember, and fast to play), it leads to session reports that sound like real battle reports, and illustrates perfectly the notion of design for effect. It successfully recreates the fog of war in command transmission by restricting orders, which may not suit players used to having total control over their armies. But this adds tension, bluff and boldness, all improvements in my view! If you want to read the whole article, and/or read the other articles in the issue, it is already available on the journal link above. Thanks for reading! Oh, how I wish people would read the previously written reviews before writing their own, particularly if they intend to complain about the card mechanic. I post here the CCA part because I thought that the restriction aspect is often overlooked and people mostly get the limitation one only. Every now and then someone asks: why wouldn't any card activate any one unit? And this review tells you why. Did you read this ONE review? to it's entirety?? "It successfully recreates the fog of war in command transmission by restricting orders, which may not suit players used to having total control over their armies. But this adds tension, bluff and boldness, all improvements in my view!" May have been a misunderstanding. Yes, I did somewhat misread what you wrote. However, "restricted" is a mis-characterization. The cards you have in your hand define what you can do, not what you cannot do. Other games would put your units through a series of trials and restrictions: you might have an operations range; you cannot move until a unit again until all are ordered; units may be demoralized, disorganized, out of supply, etc. ; they may be pinned; they may not be able to react to covert units and those not in LOS. (Of course, some of those things would not apply to ancient combat). In a C&C game, a player can order a unit more often than most wargames would allow. Let's say I order a cavalry unit on my left with a card. That unit might suffer a two-block loss. It might be forced to retreat. On my next turn, I can order that unit again. I don't have to roll for morale; I don't need to deplete its combat strength. I don't have to wait until all the units are ordered. And I don't have to waste turns making rolls and checks only to find out that I can do nothing with that unit. All that matters is that I have a card in my hand that allows me to order on the left. Compared to other wargames, the card system reconceptualizes something that is usually negative as something positive. If I have the card, I can take the action. Nothing else matters. In the majority of wargames from my teens, players had total control over their units, and that is the worst way I can think of to simulate the battle experience, even if it was the most popular one at the time. In the article I've written I take that starting point and analyse the different schemes that have progressively introduced the fog of war. First, the command was limited. Some information was hidden from the opponent, and you could not activate all your units, just a few. But you had the choice of which ones. For example, in Hold the Line or Battles of Westeros the C&C restriction has been removed, command is only limited. So you have a handicap, but you can still be 100% sure that the most critical unit(s) will be ordered. Some players prefer this feeling of total control over at least part of their units, but I don't. We must have been playing very different wargames, because in mine you could order the majority of your units, if not all. And in the example you quote, you can "order that unit again without rolling for morale" ONLY IF you have the card. Most of the time, players (especially inexperienced) will waste all their cards in a row and run out of command in a section. The most recurrent critique to CCA is that units are NOT ordered often! By adding a layer of morale/supply/whatever rolls, you may get the same restriction, but in a different way: more fiddly and without bluff. And IMHO this is worse. You need to roll dice and check charts, and none of the players knows if the unit will react. With the cards, you abstract everything and at least one of the players knows, introducing a double-guessing that represents better (again, IMHO) the battle tactics. As I said, the restriction is not negative at all, it is positive. What was negative was reaching this restriction by adding layers of fiddliness. I find much more elegant reaching a similar result with a much more abstract and simple mechanism. It is the design for effect at its best. I understand that some people prefer layers of rolls, checks and tables, because they are used to them or simply like them. But I don't think those games are better recreations of their wars, and I find them definitely less elegant, which was the central point of the article. This game has been on my wishlist for years. Agreed but like any good game this one has its strengths and weaknesses, and I don't know if elegant combat resolution (compared to games using a CRT) is a strength. It gets a bit fiddly knowing how many dice to roll for different troop types according to the situation, which are hits, which can be ignored etc. And I forgot to add, rolling for morale, supply, etc. has very little strategy involved, but the cards introduce hand management, that is very strategic. There are some very good posts in the strategy folder here. Basically, just playing the card that seems the best every turn is a very bad play. So the improvement is not just about elegance. Thanks! Don't hesitate, as I said elsewhere this would be my favorite game even without any expansion. The base game lets you play a lot of battles, much more than the ones that come in the box, and every time you play them the flow of battle is different, because of the cards! In a C&C game, a player can order a unit more often than most wargames would allow...Compared to other wargames, the card system reconceptualizes something that is usually negative as something positive. If I have the card, I can take the action. Nothing else matters. That's a first in my experience: reading that a chief flaw of the C&C system is that it allows a player too much control over their units! Computing hits seems straightforward too: target color, swords for sword troops (not light), helmets if there is a leader, flags... I agree there are a few issues that require some learning, like elephants and maybe chariots, but there are many scenarios without them that you can start with, and play those including them later, when you know the game well. I play regularly on VASSAL and it is a pleasure to 'read' the result on the dice, and not cross-checking a table away from the screen. ...which is exactly what I did! Go on, buy it... you know you want to. Personally, (and in no small part because I really like the system) I find that determining how many dice you need to roll is fairly intuitive and can be internalized quickly. I rarely need a chart in my hand. I don't spend a big chunk of my turn moving pieces just-so to achieve the perfect odds. And the results from a combat are more variable. ...Ah! Franchi beat me to that point. Yes, I was going to respond with something similar. Calling this mechanic "fiddly" is... a bit bizarre. To me, the only "fiddly" part is that Auxilliaries hit with swords even though they're green. I still sometimes forget if I'm too far away. I made a similar report at that game page, so if you want to read that part you can find it here. I can't agree more with what you wrote. And a very good article! Any chance to read it in its entirety? I've seen no option to buy an electronic copy of the issue in the page of the journal. I've seen no option to buy an electronic copy of the issue in the page of the journal. And I did the same thing also, bought all the expansions !